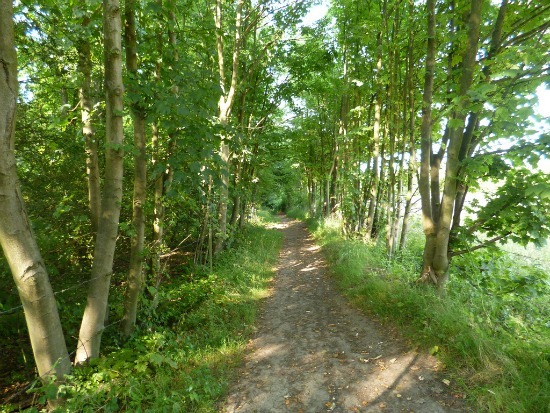 This short walk takes you south along the old coaching road that once provided the main route between North Mymms and South Mimms. It opens up into a rural valley surrounded by rolling wooded hills and includes footpaths edged by hedgerows rich in wild flowers. There is an option near the end for refreshments at The Woodman Inn at nearby Water End. Note: There is an interesting variation of this walk which focuses on the fascinating geological features of this walk. 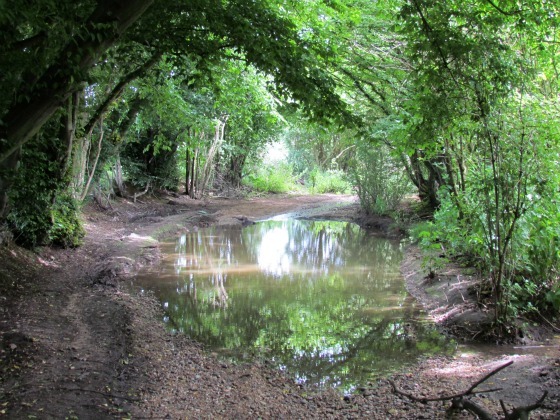 It's on our site the North Mymms History Project and is entitled The natural history around Water End, Hertfordshire. you might want to read it before you set off on this walk. It includes maps and directions, too. 1: There is plenty of parking near North Mymms Church (except when services are being held). Turn right out of the car park and head south-west along St Mary's Church Road. 2: At the point when the lane turns sharp right, your way is straight ahead, through a gate and along a bridleway (North Mymms bridleway 002). The path, which starts flat, veers slightly to the right and the fields and climbs steadily south-west through Cangsley Grove. 3: This climb lasts for almost 1km through rich woodland until the path opens out into a wide vista across the secluded Potwells Valley. Rolling hills surround this peaceful spot and this is a good place for a short stop to enjoy the view. Continue heading south down the hill, ignoring the footpath leading off to your left. 4: You reach a footpath crossroads where you turn right (Ridge Footpath 29) and climb the hill heading south-west to the woods in the distance. Here you reach a gate. 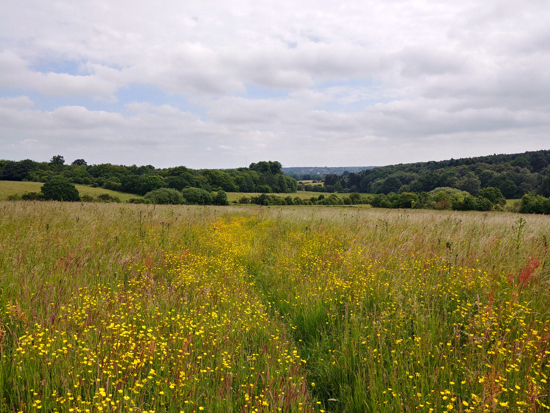 5: At this point you could take a slight detour (show with the yellow line above) through the woods and along a track with the woods on your left and fields on the right to take in a wonderful view to the west over to St Albans. 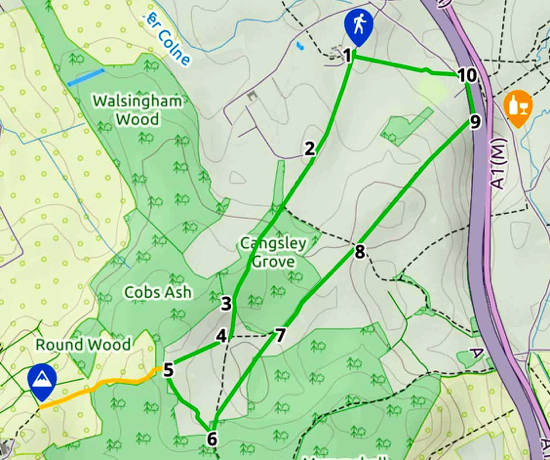 If you don't take the detour turn left (Ridge bridleway 10) at the gate (don't go through it) and drop down heading south-east with the woods on your right until you meet the track you were on earlier (North Mymms bridleway 2). 6: Here you turn left for a short distance looking out for a path on your right (North Mymms footpath 1) cutting north-east through the field and dropping down to where a wooden bridge crosses a stream. Climb the hill on the other side of the bridge, still heading north-east until you reach a wooden gate leading to a path running along the southern edge of Cangsley Grove (North Mymms bridleway 1). 7: Turn right on this path and follow it north-east, past Cangsley Grove and out into open farmland. 8: At the footpath crossroads continue straight until you reach the side of the A1(M). 9: Here you turn left (North Mymms BOAT* 5) and follow alongside the west side of the A1(M) until you reach a lane. Here you turn right. 10: Soon you reach a footbridge over the A1(M) look out for a clearing in the hedge on the left. There is step stile leading into a field (North Mymms footpath 6) head diagonally to your right following the path back to North Mymms church. If it is muddy or there is a 'Bull in field' sign, you can walk along the lane and back to St Mary's church instead. * Note: BOAT stands for byway open to all traffic.